Rangers manager Mark Warburton insists he has the experience to deal with the pressure of facing Celtic in next month's Scottish Cup semi-final. Former Celtic boss Neil Lennon was quoted saying: "Nothing will prepare Warburton for his first taste of the Old Firm as a manager." 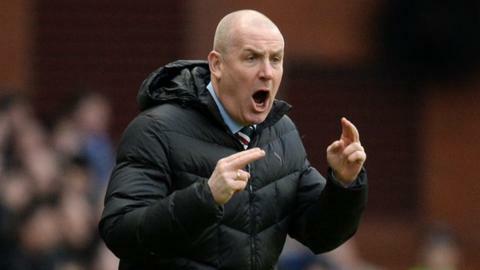 Warburton responded: "My background is one that's involved many pressurised situations in and out of football. "If I can't deal with it, I shouldn't be doing the job, simple as that." Rangers lost to Glasgow rivals Celtic in last season's League Cup in what was a one-sided contest. Both sides lead their respective leagues, with Warburton close to clinching promotion to the top flight in his first campaign at Ibrox. Asked about Lennon's comments, he continued: "I'm sure certain managers will say they have been misquoted or things have been taken out of context. "You can't turn round and say you are ready for it but I'm also somewhat bemused by people who say you won't be able to deal with it. "The fact is we've dealt with it all season. It's another game of football. We understand the significance of it. It's a highly-important game for the fans and it's a semi-final. I get all of that. "But if you can't deal with that, don't be in the business." Lennon also suggested Celtic will have the upper hand due to superior strength but Warburton does not fear being outmuscled at Hampden. "Football is a game of opinions and that's the beauty of the sport, it incites so much opinions," said the former Brentford boss. "But the fact is that we are very confident in our side and how we have fared this season. Our physicality in our minds is not in question." Victory away to Raith Rovers on Saturday, coupled with Hibernian dropping points to St Mirren in Paisley, would deliver the Championship crown for runaway leaders Rangers. "Raith are on a very good run of form right now so we need to go there and deliver a performance, otherwise we'll get hurt," added Warburton. "The focus is very much on what we do. What happens away from us we can't control but what we can control is our own performance. "On Saturday and Tuesday [at home to Dumbarton], the lads have the opportunity to take the club back to the top tier of Scottish football, so they are well aware of the significance and the expectations of the fans, the desire to get Rangers back to where they need to be. "They recognise the opportunity but they've got to enjoy it. We don't want to limp over the line. We want to finish in a convincing manner."